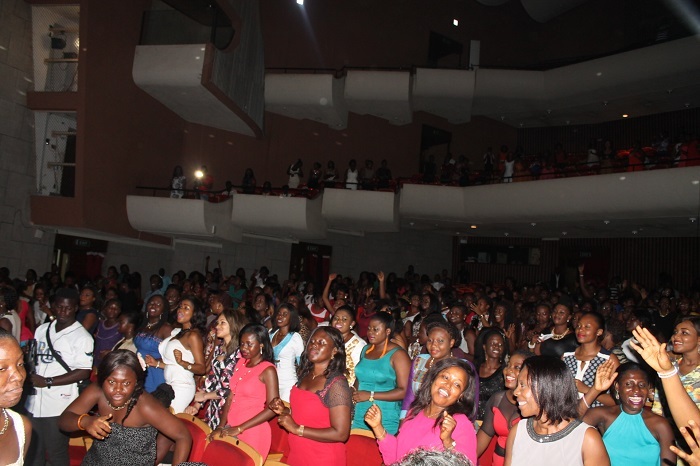 2014 edition of the annual all-female concert dubbed Becca Girl Talk took place on Saturday, December 20, 2014 at the nation’s premiere event venue, the National Theatre. Though it was an all-female show, other male personalities such as actor Prince David Osei, singers, Afriyie formerly of Wutah fame, Kwabena Kwabena, Akwaboah, No Tribe and Trigmatic were also there to entertain the ladies. For many patrons, the highlight of the night was when one Dominic proposed marriage to his sweetheart Dzigbodzi. Were you actually expecting the lady to say no? Aside Becca, other performers on the night included actress Nana Ama McBrown who performed Daddy Lumba’s ‘Yentie Obia’ song. The rest were ageless Akosua Agyapong, Mzbel, Efya, Itz Tiffany and AK Songstress. ALL THE PHOTOS: Nana Ama McBrown, Tiffany, Stacy Amoateng, Efya, AK Songstress, Kafui Danku, No Tribe, EL, Trigmatic at “Becca Girl Talk” Concert 2014 0 out of 5 based on 0 ratings. 0 user reviews.